Mr.Hegde is a Fellow Member of Institute of Chartered Accountants of India . He is also a CPA holder from Australia. 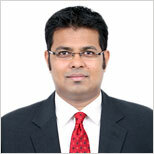 He has an experience of more than 10 years in the profession of chartered accountancy. He is versatile in Indirect Taxes, International Taxation and Transfer Pricing Practises. He is also specialised in Management Information System and Business Analytical Tools. Our initial vision manifested into reality in 2007 in the form of Olive Tree Management Consultants Pvt. Ltd. for providing reliable, efficient & cost effective Accounting and Finance outsourcing services, to Large as well as Small and Medium Enterprise segments. We are based in Bangalore, India since inception, focusing on rendering innovative and customized solutions to our continually growing extended family. One amongst the strong and compelling features of our group is that it comprises of an optimum amalgamation of young, dynamic, energetic and enthusiastic individuals with innovative ideas and extensive Business Accounting and Finance experience, working as a team. To be the most desired team in providing value based services, for outsourced Business Accounting, Finance and Compliance support - locally as well as globally. To consistently provide: Time, Cost and Quality Efficient solutions to ensure seamless operations of our clients’ businesses. To outclass all competition by emphasizing our clients’ best advantage at all times. © 2018. Olive Tree Consultants Pty Ltd. All Rights Reserved.